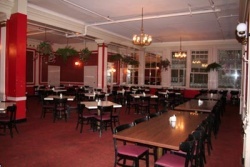 The private room at Clifton's Cafeteria in LA, California, where Danny Henry prophesied over William Branham. The prophecy was spoken in French. Danny Henry had no knowledge of the French language. I, Victor Le Doux, am a full-blooded Frenchman; born- again Christian, filled with the Holy Spirit. My address is 809 North King Road, Los Angeles 46. I attend the Bethel Temple, Pastor Arne Vick, pastor. A true translation that I proclaim, of prophecy said over Brother Branham, given by Danny Henry in French, February the 11th, 1961, at the Full Gospel Business Men's breakfast. A true translation of the prophecy. Because you have chosen the narrow path, the harder way, by your own choosing. You have picked the precise and correct way, and it is MY WAY. What a glorious decision you have made. Because of this momentous decision, a huge portion of Heaven awaits you. This in itself is that which will make, and bring to pass, the tremendous victory in the love Divine. We have only William Branham's word as to what took place. Given his significant problems with Credibility, we can not take his version of the events as true without corroborating evidence. This man come up there, put his arms around me, and was going to say… He said, "Brother Branham, not to be sacrilegious, but that could've made the 23rd chapter of Revelation. You know, another Book added. Of course," he said, "that wouldn't be right, of course, we're not supposed to add anything to It." And just as he started to say that, he started speaking in tongues. And the boy didn't know what speaking in tongues meant. And as soon as he did, right out in front of me was a French woman from Louisiana; she said, "That needed no interpretation. That was pure French." And a man over here got up and said, "That's right." And way back in the back was the interpreter for the U.N., give his name, never been there before. He said, "Correctly. That's right." And here's what they got together. And each one of them had the same thing when they come together, each one of the ones giving the interpretation, exactly. And this Frenchman, the second one over here, he wrote it out, because he'd been taking minutes of the meeting. "I, Victor Le Doux, am a Frenchman, full-blooded, borned again Christian, filled with the Holy Spirit. I live at 809 North Kings Road, Los Angeles 46, attend Bethel Temple, Arnie Vick is our pastor," a Pentecostal minister, biggest Pentecostal church in Los Angeles." A translation of a prophecy over Brother Branham, give by Danny Henry in French, February the 11th, 1961, at the Full Gospel Business Men's breakfast; a true translation of the prophecy." All three of them said this is it. Because thou has chosen the narrow path… 306 See, just against, I'd have to walk by yourself. See? I can understand that. Moses had to make his choice too. See? He didn't have to do it, but he did it. See? … the harder way, thou… (See?) Because thou has chosen the narrow path, the harder way, thou has made—thou has walked of Your own choosing. In other words, I didn't have to do it. I can side in and go with them if I want to. But I stayed with the—want to stay with the Word. Thou has picked the correct and precise decision, and it is My way. If you'll notice, it's punctuated and underlined. If you notice, it's wrote in French, this; spoke in French, verb before the adverb. See? Because of this momentous decision, a huge portion of heaven awaits thee. Now, that's what I wondered. When I die, will it be? Then I happened to think, "Heaven's not portioned off to different portions to us up there; heaven is the Kingdom of heaven that's within us, one waits for." See? Now, watch. What a glorious decision thou has made. This is itself is that which will give and make come to pass the tremendous victory in the love Divine. See, we'd say it, "In the tremendous victory in the Divine love," but in French it would be "love Divine." Just like German or any other (See?) they get the—they put the verb before the adverb. And then there was a man setting on the corner, he said, "That's correct. I've got wrote down what he said, is French." Way back in the back, a blond-headed, handsome-looking fellow, standing up against the wall, come forward and compared notes. He was the interpreter for the U.N., for French. And this man over here was Victor Le Doux, of the Arne Vick church out there, and he wrote it down. And I've got the interpretation to it. Listen to this, if I can read it. "I, Victor Le Doux, am a full-blooded Frenchman; born-again Christian, filled with the Holy Spirit. My address is 809 North King Road, Los Angeles 46. I attend the Bethel Temple, Pastor Arne Vick, pastor. A true translation that I proclaim, of prophecy said over Brother Branham, given by Danny Henry in French, February the 11th, 1961, at the Full Gospel Business Men's breakfast. A true translation of the prophecy." Now, here is what It said. Because thou has chosen the narrow path, the harder way, thou has walked in your own choosing. Now, I can see that. Moses had to make his choice, too. See? Thou hast picked the precise and correct way, correct decision, and it is MY WAY. Underlined, "My Way," the Holy Spirit speaking back. Because of this momentous decision, a huge portion of Heaven awaits you… awaits thee. What a glorious decision… (Now listen close.) What a glorious decision thou has made. This in itself is that which will make, and come to pass, the tremendous victory in the love Divine. You notice, it's the verb before the adverb. See, the French. Now the U.N. interpreter interpret that. And the boy knows not one word, never heard—never heard of such a thing as speaking in tongues. He was a Baptist. Just happened to drop in there, and heard that music, and said… come up there and stand up there and listen at me preach. 138 Now, "in the love Divine," Divine love. How can that be Divine love if it isn't the—the Holy Spirit? The Holy Spirit is Divine love. And I was preaching in Los Angeles, at the Business Men's breakfast. And Something there just laying down on those organizations, and there set the head man of the Assemblies, and many of the great dignitaries had gathered in there. And when I got through speaking and started to leave the platform, getting ready... Cause, the Message was being sent out across the--the--the nation, on radio, and had to change back. During this change, when they cut off the radio, then, to send that Message out, and come back and announce the station. And I was at Clifton's, where we have the breakfast. And as I was walking from the upper platform to the lower, a fine handsome-looking young fellow of about thirty years old, run forth and threw his arms around me. He said, "I'm Danny Henry." And not knowing that that was his brother doing the televising. And, uh, it televises there for the Christian Business Men. And it's Jane Russell, that movie star, her cousin. Her mother is a Pentecostal preacher. And then when they started running to me, and he throwed his arms around me, and said, "God bless you, Brother Branham." He said, "I hope this don't sound sacrilegious, but, to my way of seeing it, that Message could be the 23rd chapter of Revelation." And when he said that, he started speaking in tongues. A boy who had never even heard of such a thing, a Baptist by denomination. And as soon as... He turned white, and he looked at me. He didn't know what to do. There is man setting here was there. Were you there, Fred? How many was there at that time? Yeah, there is the three here, was there at that time. And he didn't know what to say. And there was a great big French woman setting down here. She raised up, she said, "Why, that don't need any interpretation. That was purely French." The boy said, "I don't know one word of French." And she had wrote down what he said. And then there was a man setting on the corner, he said, "That's correct. I've got wrote down what he said, is French." Way back in the back, a blond-headed, handsome-looking fellow, standing up against the wall, come forward and compared notes. He was the interpreter for the U.N., for French. And this man over here was Victor Le Doux, of the Arne Vick church out there, and he wrote it down. "I got through just tearing the churches to pieces, telling them how they were doing evil, and the things they were doing, rejecting God..."
Danny Henry don't know... like myself, he hardly knows good English, let alone French. If you notice in there, it's like the French language, they put the verb before the adverb. And the interpretation of all three was exactly alike." This page was last edited on 22 August 2015, at 05:26.